Exploration Day is a day where you pick a topic you don’t know much about, and you explore, research and learn all about it! First, we find articles and resources and we gather information. On Exploration Day itself we give a presentation about all that we learned. Some of us create poster presentations, and some of our classmates create scaled models and displays. You can use charts, diagrams, dioramas, and you can compare and contrast to really demonstrate your learning! We are exploring things like the difference between black holes and worm holes, why the Titanic sank, how robins build their nests, the invention of the lightbulb, and sharks! Since this is a one day event, we have essentially the whole day (except recess and lunch) to work on our projects. It’s a pretty exciting thing, because we get the freedom to pick a topic that interests us, and we can figure out what we can make with the materials we have available. This project makes us a little nervous because it takes a lot of work and we have to present our final results to everyone! But it’s good because that will make it even more satisfying when we are finished. The expectation at the end of the day is that we learned more about our topic and feel confident presenting to our parents and friends. It’s really fun because it doesn’t have to be just about things you would normally learn in the classroom, we can learn about things we are truly interested in, which makes the research a lot more engaging. We can’t wait for the next Exploration Day! Meridian’s commitment to create an equitable and inclusive culture is both inspiring and engaging. It is present in all aspects of our school from institutional practices to program and community. We strive to reflect this continuous and intentional work in our everyday practice. For this reason, we offer opportunities and experiences that challenge and promote growth in cultural competency for our entire school community. At the center of these efforts is each and every Meridian student. Our ultimate goal is to educate culturally competent, well-rounded, critically thinking students who are prepared to be responsible and active local and global citizens. We are continuously enriching our program to achieve this goal. Our faculty’s current work involves reviewing our curriculum through the lens of our Global Citizenship Framework. Based on the desired outcomes and skills that we want to foster in our Meridian graduates, we integrated global competency with equity and inclusion education based on curriculum frameworks and core standards. 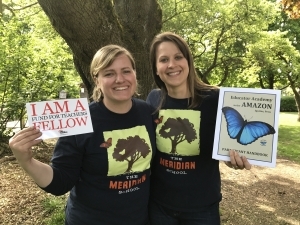 Throughout their years at Meridian, students will develop the awareness, skills, and knowledge required to take action and promote positive change locally and globally. 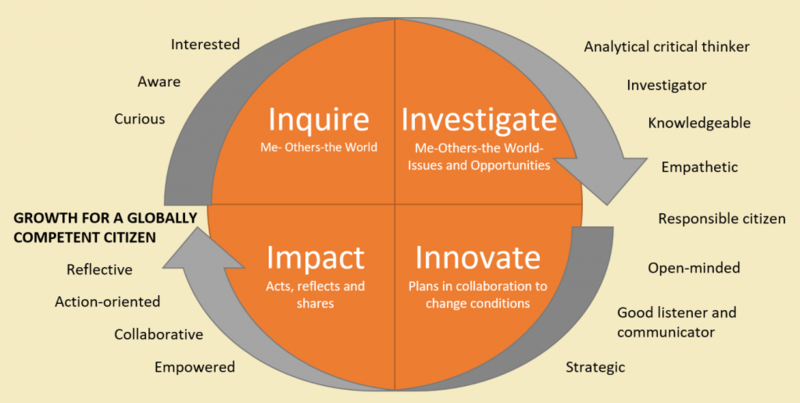 The framework includes four domains: inquire, investigate, innovate and impact, which we refer to as the 4 I’s. Each domain has a set of outcomes that faculty assess within their units. Students discover more about themselves, others, and the world through inquiry and investigation. 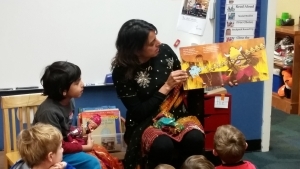 They learn about identities and cultures and how we all contribute to diversity and enrich our communities. They analyze and consider how our respective experiences and cultures influence our perspectives. By understanding and valuing the existence of multiple perspectives, students to develop critical thinking skills and empathy. Students also thoughtfully discuss natural and social issues and how they affect communities. They develop a sense of responsibility as global citizens and are empowered to collaborate, plan, and take action to change conditions with big or small everyday actions. Kindergarteners have been learning about aspects of identities and families, and considering what makes us who we are and how it can change over time. As a part of this unit they are discussing internal and external identity, cultural and religious celebrations, and the many family structures and traditions that make up our classroom community. First graders are learning about rights, responsibilities, and what it means to be an actively engaged local and global citizen. 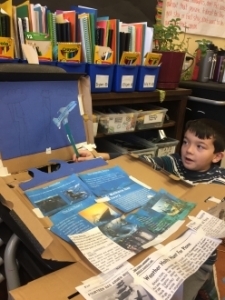 Second graders are investigating how people and place are connected through exploration of how individuals contribute to the many different communities that they are a part of. Third grades are completing a unit about cultures, systems and values. Students will soon begin analyzing how people affect the environment and how global warming affects communities. 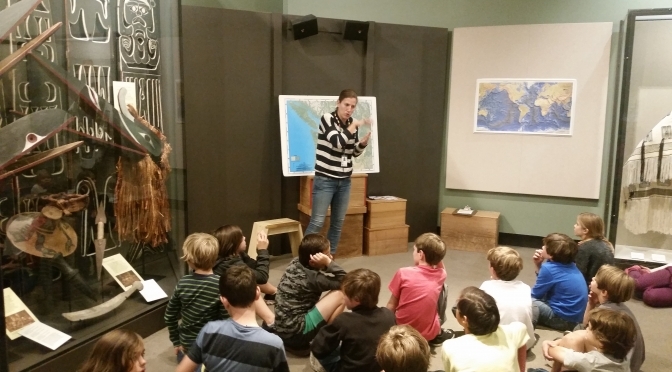 Fourth graders have been learning about Native American perspectives, Washington state history and tribes of the Pacific Northwest. Later this year, students will engage in conversations about civic and human rights. 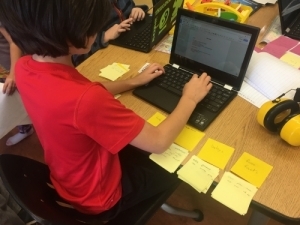 Fifth graders are researching their family heritage and will begin studying immigrant stories from the past and present in connection with our thematic, regional study of North America this year. Classroom libraries are also part of our focus as we are intentionally reviewing educational resources to ensure that they reflect inclusion of multiple perspectives and positive representation of different communities. Other aspects of the program include field trips, guest speakers, classroom workshops, and school assemblies that foster the development of global citizenship skills in our students. Developing cultural competence as a learning community requires active participation in education, and the willingness to step outside of our comfort zones to ensure that students become true engaged and responsible global citizens. Parents are encouraged to follow-up at home with meaningful conversations, attend school or local educational series relating to equity and inclusion topics, and to actively participate in the program. For example, at this time we are looking for parent volunteers that would like to teach a workshop during our Global Citizen Symposium on February 23rd! Share how you have created impact and social change through professional work or civic engagement. We will also use the opportunity to learn more about Central America, the Caribbean and North America. Please contact Marika or Yaneth to share names of people that you think could contribute to the symposium. Grandparents and Special Friends Day is a day when you celebrate your grandparents and special friends! It’s a chance for them to visit and discover the types of things you get to do at school. It’s extra special because your parents aren’t there that day so you get to spend your time with your grandparent/special friend who doesn’t know as much about Meridian as your parents do. During the day we participate in lots of activities and get to rotate and see different parts of the school with our guests and do some things that show what we learn, like publishing parties, but a lot of it is extra fun that does not happen every school day. We think it’s a great way to make our guests feel special while also learning together! The interesting thing about special friends day is that it changes year- to-year. The themes of classroom activities change, and every grade level teams up with a specialist. It is just another thing that makes it exciting and fun to look forward to–you never quite know what to expect! If you bring the same special friend each year, they get to try something new as well, which is important especially since they may be traveling a long distance to spend the day with us. Some of us asked our grandparents to visit over 3 months in advance! 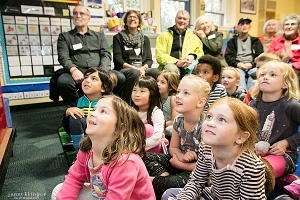 Grandparents and Special Friends Day is a time to share our learning, and reminds us that the Meridian community isn’t just the people in our school..it’s made up of all the people that we interact with every day and and throughout our lives. 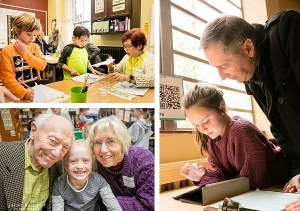 We can’t wait for the next Grandparents and Special Friends Day! Having buddies at Meridian is awesome! It gives younger students a role model to spend their first years at school with, and gives older students a chance to practice setting a good example. 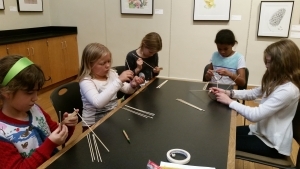 Particularly with fifth and second grade buddies, because the fifth graders get to spend their last year at Meridian teaching and helping the second graders during their last year as a younger buddy. Next year, they will get to be role models to Kindergarteners! It’s really nice to have someone outside of the classroom you can become close with. 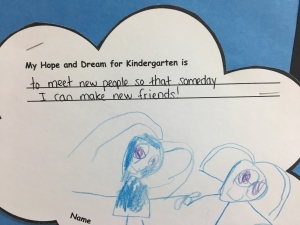 We love that we have a different buddy each year because it builds new relationships and we can have time to bond with multiple friends across grade levels. 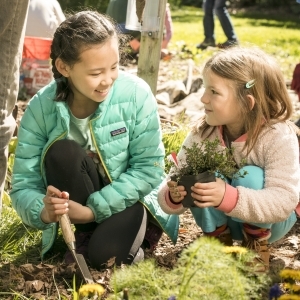 When we interact with the Tilth garden or Washington Green Schools we usually get to do it as buddy pairs, which makes the projects seem even better. When we are in the Tilth gardens we get to engage with the environment in a positive way, which we do a lot at Meridian. It helps to be involved in the environment to actually see what we are learning about in class. It makes it much more personal, and participating with our buddies helps everyone understand how to help others and get involved in improving where you live. We start partnering with Tilth in Kindergarten, and that teaches us responsibility. During Community Service Day, we went off-campus with our buddies to pick up garbage and waste around the neighborhood. It’s important to help your community, and we appreciate those projects a lot, especially since we get to share those experiences with our buddies! 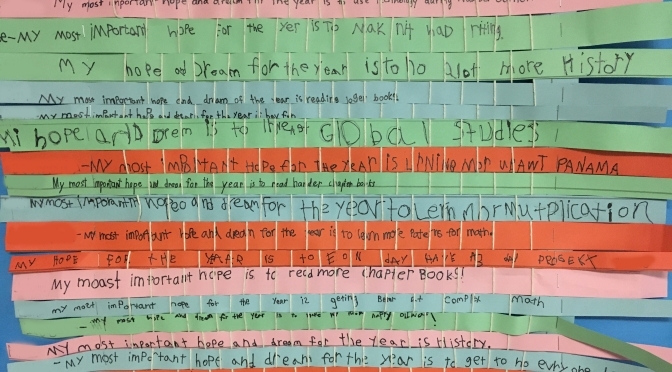 As we embark on a new school year, all of our students spent time discussing their hopes and dreams for the year! As Kindergarteners, we’re excited about reading and writing. 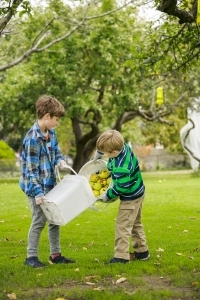 We have seen our older siblings doing it and it seems like something that’s really important. We have read stories we like as a whole class and we want to learn to read more by ourselves. It’s fun to play with so many new friends, and we hope that we can do more of that, and make even more friends this year! We love all the different classes that we get to visit, especially music. We want to perform really badly! 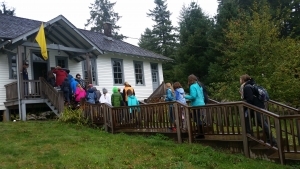 As third graders, we’re excited about more field trips, like our overnight to Camp Seymour. We’ve heard about so many things that we can learn about and do so it’s been something we’re really looking forward to. We will have homework for the first time this year, which isn’t always fun, but it does mean that we get to learn more which we like. We hope that we can go more in-depth into topics that we are studying and interested in because we think we can really dive into more projects thank we could last year. We all hope that we can keep making Meridian a better place. We love being around nature, and it is so cool that we get to experience it every day. We want to get to know our new classmates more and become a part of the Meridian community as well as the Good Shepherd Center’s community. Even though we miss summer, we’re so excited to be back at school! As our students head off on their summer adventures, our teachers prepare for a few weeks of relaxation, travel, quality time spent with friends and family, and continued learning! Every year, Meridian staff and faculty members participate in a myriad of professional development workshops. We know that providing our teachers with opportunities to further explore educational best practices is one of the most important and lasting gifts we can give our students. Furthermore, we know that the quality of our students’ educational experience is reflected by the depth of our teachers’ knowledge. Thanks to the incredible generosity of our donor community, we raised over $125,000 (to be expended over three years) to support these professional development opportunities. Each year, Faculty and Associate Faculty members are also given the opportunity to apply for an Ellen Toole grant to support special professional development opportunities. The Ellen Toole Endowment Fund was established in honor of our founding Head of School, and has been granted to faculty members on an annual basis. This summer, two of our teachers will be traveling to Peru and Ecuador for a once-in-a-lifetime learning experience! 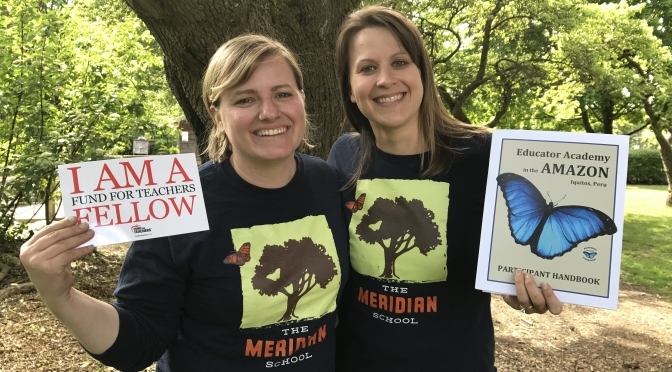 Science Program Coordinator, Kelsey Vollmer, and Kindergarten Faculty member, Libby Bode, received The Meridian School’s Ellen Toole grant, as well as a national grant from the organization Fund For Teachers to make this adventure possible. Their fellowship consists of three learning opportunities. 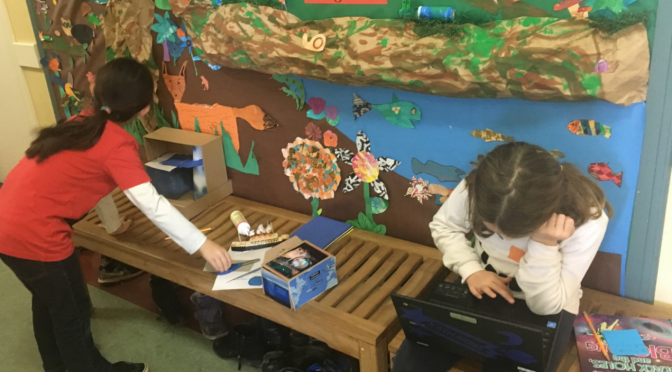 The first is the Educator Academy in the Amazon Rainforest, which is a 10-day workshop at four different rainforest lodges, designed to immerse educators in inquiry and place-based approaches to instruction. 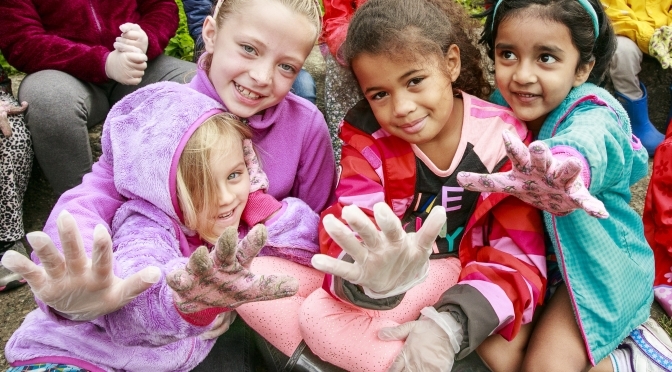 Each day they will actively participate in two learning sessions about a variety of topics, including developing a sense of place, habitat and ecosystem study, biodiversity, interconnectedness, field research, inquiry and investigation, and cultural and community connections. At the end of each day, time is given for participants to discuss their learning and ideas with one another. The second part of the fellowship involves a five-day journey through the mountains and Urubamba Valley to interact with the Quechua people and explore the Machu Picchu region, which will allow for a deeper cultural experience and contribute to The Meridian School’s work around global competency. Lastly, the grant will allow Libby and Kelsey to experience one final destination. Following their learning in Peru, they will head to the Galapagos Islands to learn about and experience the unique, island ecosystems . They will visit the Charles Darwin Research Station as well as several of the islands to practice their field study techniques. 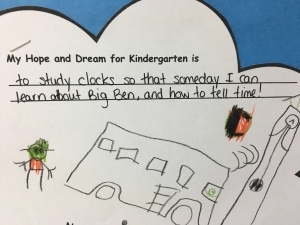 Throughout their month-long travels, both Libby and Kelsey will be strengthening their understanding of place-based and inquiry-based education and developing skills to promote questioning, curiosity, and connection-making in students. 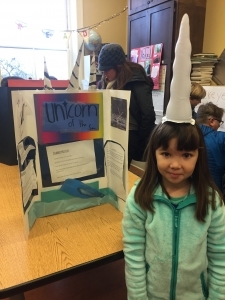 One of their major goals when returning to Meridian is to implement a more cohesive and integrated scope and sequence for our science and social studies programs, with a focus on place-based education, global competency, inquiry-based projects, and STEAM. They are extremely excited for these adventures and will be eager to share their learning with our community throughout the 2017–2018 school year!